First came the tweet, then the proclamation. 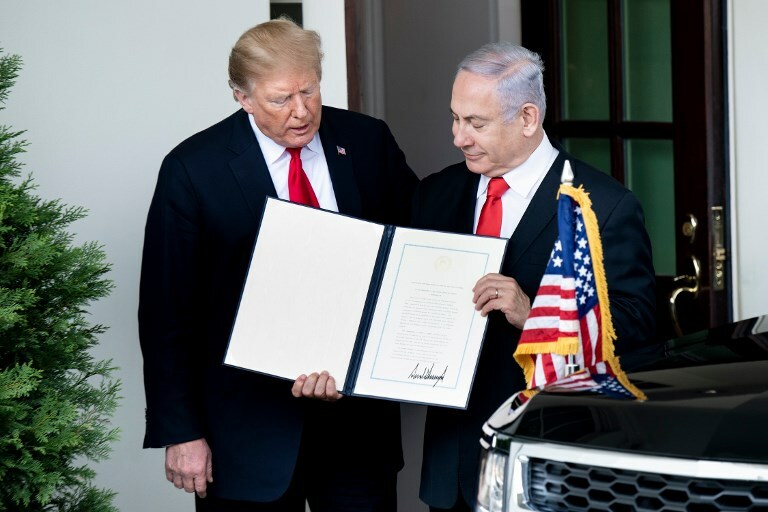 In March, Donald Trump tweeted his intention to overturn decades of settled international law and recognize Israeli sovereignty over the occupied Syrian territory of the Golan Heights. On March 25, he signed the order. Worldwide condemnation has been as swift as it was expected. Around 100,000 Syrians were forced out of the territory after 1967, when it was first occupied. Their fate is unclear, as is the fate of the Syrian Druze who remain. Yet the Golan Heights issue is less about Israel than it is about the rest of the world. Yes, the decision effectively rewards Israeli politicians for breaking international law. But it goes beyond that, creating conditions for military power to become, after many decades, the decisive factor in international relations. A decision taken for short-term political gain will have severe long-term consequences – among them, making other parts of the world much less safe. The legal norms regarding the inadmissibility of acquiring territory by force have held since the end of the Second World War. They have been part of the foundation of a system of rules that ensures strong countries do not simply bully others and steal territory. Accepting the annexation of the Golan Heights in this way creates a precedent in areas where borders are not long-established. In the Middle East, where Turkey wants to establish zones of influence along Syria’s northern borders, it could bolster the case for Ankara to occupy Syrian territory. But it will have repercussions beyond the Middle East; indeed, the Golan Heights precedent will be particularly dangerous for the European Union. The most obvious parallel to Israel’s seizure of the Golan Heights in the modern world is Russia’s seizure of the Crimean Peninsula from Ukraine in 2014, which the US both criticized and sanctioned Russia for. But if Israel can seize Syrian territory and the US accepts it, why could the US not accept it when Russia seized Crimea? Indeed, the seizure of Crimea even had a veneer of democratic legitimacy, in that it was put to a referendum in the territory; the Syrian Druze in the Golan Heights and the thousands of Syrians who were forced out will certainly not be asked their views. Yet it goes beyond that. The borderlands of the European Union are full of contested borders; areas where the border has not been properly demarcated, or only recently demarcated, or, most commonly, demarcated under circumstances of force or pressure. In the Baltic states, in the Balkans and in the areas around the Black Sea, there is plenty of scope for border conflicts to be reignited. Moreover, border conflicts have proven incredibly emotive and are easily weaponized by right-wing groups under the banner of patriotism. It was the settler movement in Israel that pushed the Golan Heights issue from the 1990s; supporters can still be seen in Tel Aviv with “the people are with the Golan!” plastered on the back of cars. That fervent combination of land and people is combustible, and countries from Ukraine to Macedonia have their own experiences of it. The next potential flashpoint between Russia and the European Union incorporates all these elements. The three Baltic countries of Estonia, Latvia and Lithuania, all members of the European Union, are sandwiched between Russia and the Baltic Sea. All, like Ukraine, have ethnic Russian populations, and all have been the targets of Russian propaganda, aimed, it appears, particularly at inflaming ethnic tensions. Judging by the Crimea playbook, the danger is that Russia could seize parts of the three countries, forcing Nato and the EU to choose between fighting a major war against Russia, or accepting the loss of their territory. The Golan Heights precedent would give a Russian president considerable moral authority to argue for the latter. The EU and Nato have long been concerned at Russian aggression toward the Baltic countries, particularly after the annexation of Crimea. At the time, Britain’s defense secretary warned that Russian might attempt the same destabilization campaign in any of those countries, just as it did in Ukraine. So seriously is the threat taken that Germany is building a new naval command center in the northern city of Rostock, on the Baltic Sea. The idea is that the facility could function as a command center for either Nato or the EU in the event of a crisis in the Sea. On the Syrian-Israeli border, the Trump decision doesn’t change much. Peace talks between the two countries broke down long ago and Israel has been allowing Jewish settlers into the area for decades. For the 100,000 Syrians and their descendants who used to live there, there is no justice, no more than for the millions more Palestinians. But what it does change is the landscape of international rules, feeding a sense that the Trump administration prefers an older world where might makes right. For all the short-term politics that Trump appears to be focusing on, the longer-term effects of this decision will be serious and significant.